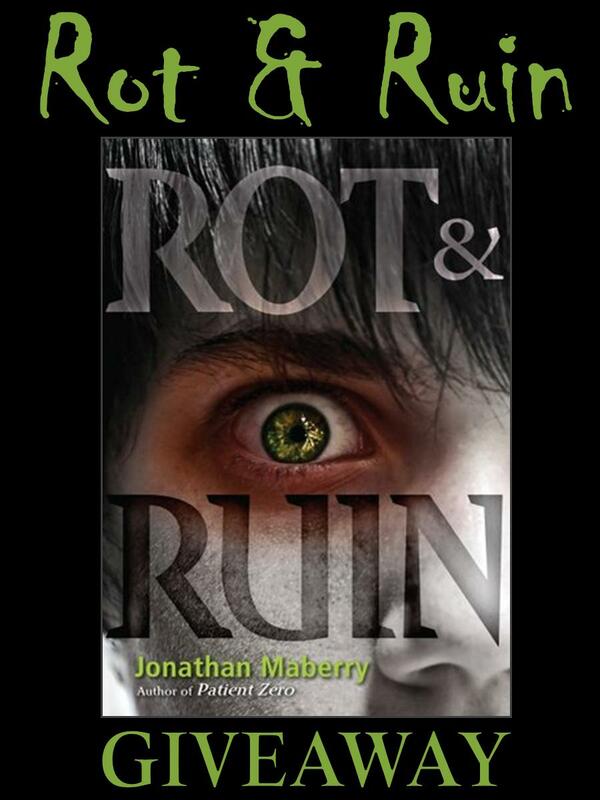 From the Shadows is giving away a hardcover copy of Rot & Ruin by Jonathan Maberry to one lucky winner! To enter, please leave a comment on this post including your email address (so we may contact you if you win). You do not have to be a follower to enter (though I always appreciate a follow!). This giveaway is to US mailing addresses only. Giveaway ends May 4th midnight EST. I've never really been interested in a zombie book, but I hope this one changes my mind! Thanks for the giveaway. I love zombie stories and this one looks like it will be a great one. Thanks for the giveaway! Wow, this book looks awesome, thanks for the giveaway! I am starting to LOVE zombie books this one looks perfect! Already a follower! Thank you so much for the chance to win!! This book has been on my TBR list for months, but haven't had a chance to get it. Sounds so good! I don't think I've read a zombie book before, but it sounds interesting. I would love to read this book! Count me in! One of books that i would really like to read ;) enter my name in . Heard good things about htis one. I'm so darn curious about this book + I love zombies!!! I love this cover. I have been seeing it around the blogs. It looks like a very good read!! I am fascinated by the post-apocalyptic genre, and have to admit, I am becoming a huge Zombie fan! Adding the author and this book to my to be read list. Thanks for introducing me to more great books! Zombie, Zombie, Zombie...Count me in. I love a good Zombie book. Can't wait!! Thanks for letting me know. I'm fighting back against zombies and as such would happily digest this book! I would so love to read this book. It has a great blurb and really the cover is just captivating. I have heard a lot about this book! It sounds wonderful. Thanks for the giveaway! I have been wanting to read this one - thank you for the giveaway! This one is on my to-buy/wish list already! I'd love the chance to win! Thank you so much! Zombie's are awesome :] Thanks you for hosting this great giveaway. Sounds like a great novel! Would love to read it! I'd love to read this. Thanks for the giveaway! I think this would be an amazing read, thanks so much for the giveaway!!!! Heeeey, awesome contest! Thank you for having it! great giveaway! to enter the zombie reading!! Count me in! 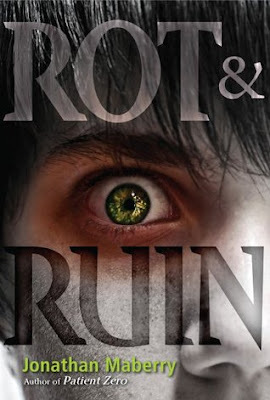 Rot & Ruin sounds awesome. Old follower. Hope you guys enjoy the book! I've had this on my wishlist and I really want to read it! Awesome giveaway! I always love a good zombie book!!! That eye on the cover just freaks me out. Gotta have it! I haven't had the pleasure of reading a zombie book yet. This one keeps popping up on blogs so I decided this will be my first zombie book. I would love to be entered to win it! I love the story idea, and would love winning a copy even more. Heck, I'd even review it on my own blog site. Nothing better than a good zombie read! Thanks for the giveaway, E.J. I'd love to win this! Thanks! I love Jonathan Maberry's books. He's such a great author. I've been very curious about this book and would love a chance to win it :) Thank you! Thanks for hosting! This one is on my TBR. I am an old follower. Wow! I have to read this one, Thank-You! Woot! Thanks for the giveaway! Never been a zombie fan, but have seen good reviews for this. My son would probably enjoy this book! Looks like a Nice book. A good Zombie book is hard to find. If the reviews are any indication this is one not to be missed. The proof is in the reading. I've really been wanting to read this. Thanks for the giveaway! Looks good! I have yet to read a zombie book so this may be a good place to start. Am i too late, oh i hope not!! Ive been wanting to read this book!! Thank you for this chance at the giveaway! !